Super Furry Animals, Charlotte Church and now Public Service Broadcasting to join thousands of others in protest to disrupt the Tory Party Conference. 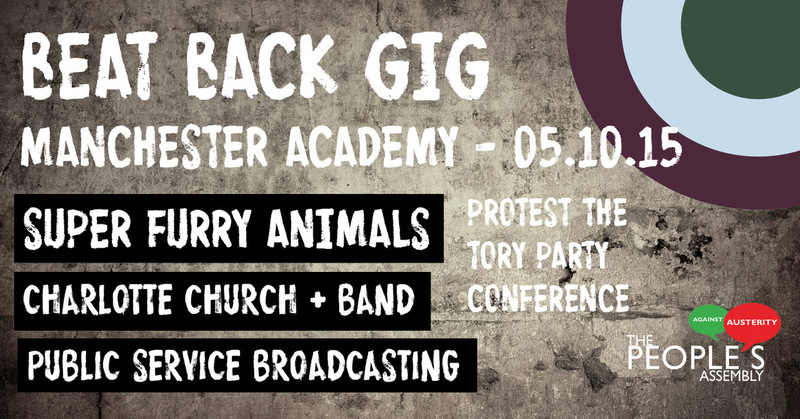 As part of a jammed packed week of protests, public meetings, direct action, theatre, music and comedy at Manchester Academy on October 5th 8pm. – Public Service Broadcasting’s J. Willgoose, Esq. The week of action called by the People’s Assembly Against Austerity against the Conservative Party conference from 3-7 October in Manchester. It follows the 250,000 strong demonstration in London in June organised by the same organisation. Thousands are expected to travel from across the country to join the protests which include a National Demonstration organised by the TUC, direct action, public rallies, comedy, theatre, gigs and more. Other participants throughout the week include: Jeremy Corbyn MP, Frankie Boyle, Sam Fairbairn, Natalie, Len McCluskey, Mark Serwotka, Julie Hesmondhalgh, Owen Jones, John Hillary, Terry Christian, Sam Duckworth, Kate Marlow, Mark McGowan, Kevin Maguire, Francesca Martinez, Mark Steel, Jeremy Hardy, Dave Ward, Sara Pascoe, David Walker (Bishop of Manchester), Lindsey German and more to be announced.